What Is Or Isn’t A Wall? Democrats Have Been Pretty Firm On One Thing: No Wall. And Trump’s Been Pretty Firm On One Thing: Wall. (Well, really two things: that, and “winning”). The bipartisan conference committee tasked with hammering out a border security agreement in order to head off another government shutdown, continues to work in earnest behind closed doors today. And according to the Washington Post, negotiators are hopeful they will be able to deliver a deal to Congress by tomorrow, or close to it. Whether the President would sign it is a different story. Compromise or no compromise, Trump will hold his first rally of the year Monday in El Paso, Texas, a city he keeps portraying as crime-ridden until a border wall (actually a fence) was constructed there. Which is completely untrue according to this analysis by Snopes, and others. El Paso was never a high-crime city. House Speaker Nancy Pelosi says she will support any compromise the bipartisan committee delivers, and is urging the White house to do the same. Senate Majority Leader Mitch McConnell urged negotiators to reach a deal, even if it’s not certain Trump will approve of it. Still, McConnell could decide not to bring it to a vote should it be clear Trump won’t sign, and the White House is able to pick off enough Republicans that it might not pass in the Senate. There will almost certainly be some funding for some type of additional barrier or fencing. While the package overall may add up to the $5.7-billion Trump is demanding, it won’t mostly be used for construction of that fencing, which is what the President wants. It almost certainly won’t include a compromise on DACA, the program Trump’s trying to kill that allows children of undocumented immigrants stay in the country. Trump has recently been saying he wants the DACA case to be decided by the Supreme Court. And we can see why: beyond the core issue, if he wins the case it would represent a huge enhancement of his Presidential powers. So what’s a fence and what’s a wall? Money no longer really seems to be an issue: Democrats seem willing, even eager, to spend the $5.7-billion dollars on border security Trump demanded (quadruple the amount they were willing to give the President in December). On all kinds of border equipment, personnel and activities, as long as it doesn’t involve a wall. This in itself is actually a victory for Trump; forcing Democrats to vastly increase border funding in order to prove the President’s not right when he says they’re for open borders. (We’ve also said the President could take that “win”, and do a victory lap, saying that’s what he was after all along). Those don’t look like walls to us. At least not walls in the way most of us have come to know what a wall is based on our everyday experiences with walls. But they are very definitely barriers. Yeah, that does kind of look like a wall to us. No it’s not Trump’s 30 foot high coast-to-coast concrete wall. But it’s been something the White House has been practically shouting is acceptable back to Sean Spicer days, at times to the consternation of far-right media. And it’s what’s Trump’s referring to when he keeps saying his wall is already being built, so he clearly considers bollard fencing to be a wall. 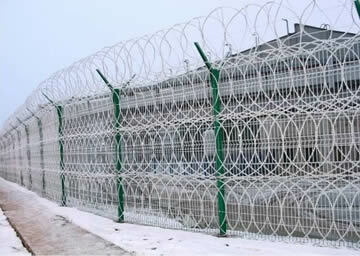 Normandy fence, concertina wire, bollard fence: barriers of all those types would be effective against much of the type of smuggling and human trafficking the President claims is rampant these days. Would these types of barriers stop massive shipments of drugs that smugglers are bringing into the country by just “making a left” as the President likes to say? Check. (Even though most evidence–and the recent huge border bust we reported on– shows most drugs hidden in vehicles coming through official ports of entry)? Would it block the “bigger, stronger, and faster vehicles” the President imagines making continuous border incursions? Check. Would it slow the form of human trafficking that seems to most fascinate the President: women duct-taped in the back of a van being driven across a no-man’s land of some kind? Check. So these barriers would seem to be sufficient to repel most of the border threats (real or imagined) Trump continually points to. And in some ways that backs up Democrats’ arguments that big walls are a waste of money, because the form of illegal immigration that was prevalent for several decades: that of young men sneaking over, or tunneling under, or swimming across the Southern border is on the wane; has been for years. Nowadays, most of the growth in undocumented people in this country comes from people overstaying tourist visas. Normandy fencing and Concertina wire, if deemed sufficient, could also instantly solve one of the biggest problems Trump’ll face building his wall: seizing acres upon acres of border land from the private citizens who now own it. Those types of barriers are far less obtrusive. And even though bollard fencing is a little more bulky, it’s still far less than a giant concrete wall. But will the wall, or barrier–whether it’s Trump’s or anyone else’s–do anything to stem the tide of refugees legally seeking asylum at U.S. border crossings? No. And that’s the issue Trump’s having the biggest problem dealing with, and the one he wants to change most radically. And despite the harrowing pictures the President and his Administration paint of huge caravans of Central American refugees (sometimes they also throw in terrorists) hell-bent on rushing the border, that’s not what’s happening. And couldn’t have less to do with the supposed urgent need to build a wall. Unless perhaps Trump is successful in radically changing asylum laws to keep most all refugees out. In that case, maybe sneaking into the country would become the prevalent way again. And then a wall might help. But is Trump thinking that far ahead? We don’t know. But even if that scenario comes to pass, it’ll again be an example of a crisis wholly of Trump’s own making, that he’ll be leaning heavily on anybody other than him to fix. Next PostWhat Could Be Worse Than Trump Not Listening To His Generals And Intelligence Chiefs?